Watering rhubarb is essential for maximum stalk production. Rhubarb plants are heavy feeders. Like most other plants, rhubarb absorbs nutrients from the soil. If the soil is too dry, the plant has no way of absorbing those vital nutrients and will eventually starve to death. And if there aren't enough nutrients in the soil to start with, the plant won't have much of a chance. 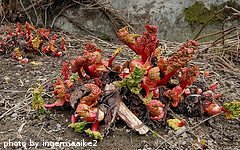 It's a good idea to keep the soil moist around rhubarb plants. This doesn't mean that the surface of the soil should be constantly wet. Dig down into the dirt around your rhubarb plants. If the soil is moist 4 inches down, you're in good shape. If it is soggy, let it dry out for a couple of days and check again. If it is bone dry, the plants need water. When watering rhubarb plants, concentrate your efforts at the base of the plant. Wet foliage may encourage pest and disease problems to develop. It's a good idea to water in the early morning hours. This allows the afternoon sun to evaporate any unused moisture that may linger on the foliage. As the summer heat arrives, the mulch that you put around the plants will do a good job of trapping the moisture in the soil. The year after planting, it's a good idea to fertilize your rhubarb plants in early spring, before the plant begins to sprout significantly. Use an all purpose fertilizer - a 10-10-10 formula works well. Compost or well rotted manure also works well as a fertilizer. If you use a granular type fertilizer, apply it according to the manufacturer's instructions. It is usually applied at a rate of 1 1/2 pounds per 100 square feet. Sprinkle the granules in a circle around the plant, being careful not to let the granules come in contact with the plant itself. This may burn the plant or have other adverse consequences. After applying the granular fertilizer, water it in well. If you choose to use a water-soluble type of fertilizer, a hose-end sprayer or simple watering can or bucket will work just fine. 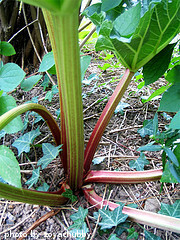 Now that your rhubarb plants are thriving, it's time to think about harvesting the stalks.